These fun, interactive and on-site workshops and lunch n' learns are part of the HUB Bike Friendly Business Program and are designed in 1-2 hour sessions for staff of all riding abilities and are subsidized by TransLink. Cycling is a health promotion tool that reduces employer costs, lowers absenteeism and turnover, and creates higher productivity, loyalty, and morale. Biking to work also has the unique ability to promote employee health & wellness and environmental sustainability at the same time, helping to make an organization a desirable, sought-after employer. Thank you to TransLink for their support of our Workplace Cycling Workshop courses. This interactive and engaging course takes the mystery out of the bicycle! Participants bring their bikes and we show them how to do a basic inspection to make sure it’s in good running order. Available in both 1 and 2 hour versions. Note: the 2-hour version is more hands-on, including fixing a flat tire. This fun and interactive workshop covers important things you need to know about biking to work in one hour. It provides tips and guidance for newer riders as well as useful info for those who already bike to work. Certified instructors will discuss bike safety scenarios, taking bikes on transit, route planning, what to wear/carry, making your workplace bike friendly and much more. Bike maps & other resources will be provided to all participants. This fun and interactive workshop covers everything you need to know about biking to work in 1 hour, delivered by a female instructor to a women-only audience to help remove any trepidation or intimidation women may have when it comes to getting on their bikes. The instructor will help demystify biking to work and show participants how riding can be fun, safe, and can be done at one's own pace. Certified instructors will discuss bike safety scenarios, taking bikes on transit, route planning, what to wear/carry, making your workplace bike-friendly, and much more! Bike maps and other resources will be provided to all participants. 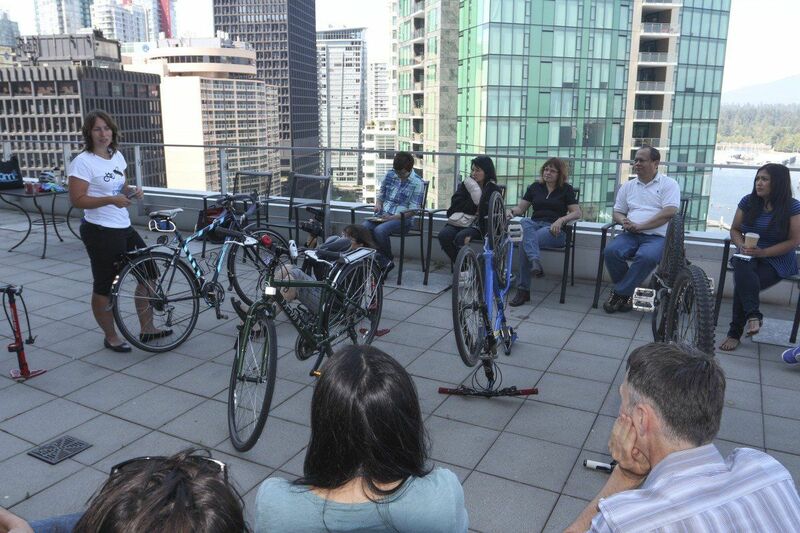 This workshop includes both in-class and on-road training, and is for workplaces that want to go a step further to support their employees to use their bike for transportation. Taught by nationally certified bike safety instructors, participants learn hands-on about the safest place on the road to ride, how to maneuver their bike effectively, communicate with other road users, handle riding at night and in the rain, and much more. Participants will gain the skills and confidence to enjoy riding in the city! Note: please bring your bike to this workshop. This intermediate-level workshop is a great way to encourage those who ride in warmer weather to try biking to work in the Fall. Participants will learn more advanced tips and tricks about biking to work in Metro Vancouver’s winter riding conditions, including dressing for the weather (staying warm and dry), more advanced cycling safety, advanced use of your gears, cold-weather care for your bike, lights and visibility, and more! Bike maps and other resources are provided to all participants.